I really do not know what to say about Cecil B. DeMille. His movies have always produced mixed feelings within me. But there are a few that I would have no trouble watching over again. And one of them is his 1942 film, “REAP THE WILD WIND”. Following the success of Margaret Mitchell’s 1936 novel, “Gone With the Wind” and its 1939 cinematic adaptation, Hollywood spent nearly two decades trying to repeat the success of the latter. This campaign began with Warner Brothers’ 1938 film,“JEZEBEL” and probably ended with MGM’s 1957 epic, “RAINTREE COUNTY”. Among the “moonlight-and-magnolias” films that hit the movie theaters during this period was “REAP THE WILD WIND”, which DeMille both produced and directed. “REAP THE WILD WIND” was based upon Thelma Strabel’s 1940 novel, which was serialized in “The Saturday Evening Post”magazine. The movie tells the story of an antebellum Florida belle named Loxi Claiborne, who runs a Key West salvage business founded by her late father. Following his death, she assumed control of the business to keep her family financially secure. Loxie’s mother deplores her participation in such rough business and would prefer her to follow the example of her Cuban-American cousin, Drusilla Alston, by behaving like a well-bred Southern belle. Loxie eventually finds romance when a hurricane forces a ship called The Jubilee to founder off the Key West coast, leading her crew to rescue its master, Captain Jack Stuart. Because Loxi and her crew did not arrive first to the scene, another salvage crew led by Lexi’s Yankee-born business rival, King Cutler, acquires the wrecked Jubilee’s cargo. It is also revealed that Cutler had hired Jack’s first officer to deliberately wreck the ship. And unbeknownst to Loxie and Cutler, her cousin Drusilla and his younger Dan have fallen in love. Loxi and Jack fall deeper into love, as she nurses him back to health. When they both realize that Jack might be fired by Charleston lawyer Steve Tolliver, who serves as manager of the Devereaux Lines, the shipping company that owns the Jubilee; Loxi schemes to win a plum captain’s position for Jack by seducing Steve and convincing him not to fire Jack. Instead, a surprising romantic triangle ensures, when Loxi finds herself becoming attracted to Steve. And this romantic triangle, leads to surprising tragedy for several of the movie’s characters. The 1942 movie not only benefited from Hollywood’s fascination with the Old South, but also from Cecil B. DeMille’s “Americana” phrase that may have began with 1936’s “THE PLAINSMAN” and ended with either the 1947 movie,“UNCONQUERED” or the 1952 Best Picture, “THE GREATEST SHOW ON EARTH”. Who knows? What I find interesting is that I ended up enjoying “REAP THE WILD WIND”, despite its shortcomings. And it certainly had plenty of those. One flaw that caught my interest was the ridiculous trial in which Jack Stuart faced prosecution for deliberately wrecking the pride of the Devereaux Shipping Lines – the Southern Cross. I found it ludicrous for a few reasons. One, Steve Tolliver was a Charleston maritime lawyer. How on earth was he able to serve as prosecutor for a criminal case that originated and was held in another city and state – namely Key West? And it seemed wrong for Steve to be prosecuting a man for a crime that personally involved him. The trial also featured the testimony of a free black sailor named Salt Meat. Were free blacks allowed to serve as a witness for the prosecution . . . against a white defendant? I rather doubt it. But the real problem I had with “REAP THE WILD WIND” were the one-dimensional characterizations that permeated the story. 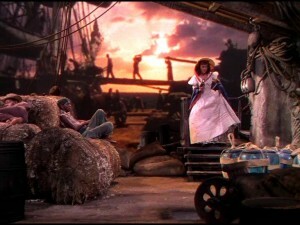 At least four of the movie’s characters proved to be complex – Loxi Clairborne, Steve Tolliver and Dan Cutler and especially Captain Jack Stuart. Unfortunately, I cannot say the same for many of the other major characters. One of those one-dimensional characters proved to be the movie’s main villain, King Cutler. Many stories about the Antebellum South have featured villains that were usually the following – an expatriate Yankee, a slave ship captain or a plantation overseer. Sometimes, the villain would be a combination of two or all three. Cutler turned out to be a sea captain and Loxi’s rival . . . who shipped slaves on the side. He was also the personification of one-dimensional evil. The Drusilla Alston character proved to be your typical Southern belle of the Old South . . . a second-rate Melanie Wilkes, but with only the mild manners. And of course, “REAP THE WILD WIND” had to feature not only its share of African-American stereotypes, but also a virtual rip-off of the Mammy character from “GONE WITH THE WIND” in the form of the Clairbornes’ maid, Maum Maria. Loxi’s rival for Steve’s affections, Ivy Devereaux, proved to be another cliché – namely the bitchy and spoiled Southern belle. The movie also features another cliché, Captain Philpott, who was not only Loxi’s ship master, but also the personification of the “salty” sea captain. Even worse, he was forced to spout “I’m a good Yankee” in nearly every other scene he was in . . . as if being a New Englander was not only a crime to the other (and Southern-born) characters in the movie, but also to moviegoers from all over the country. Milner and Skall were not the only ones that contributed to the movie’s visual style. Roland Anderson and Hans Dreier, along with George Sawley’s set decorations and Natalie Visart’s colorful costume designs certainly maintained the movie’s early 1840s setting. 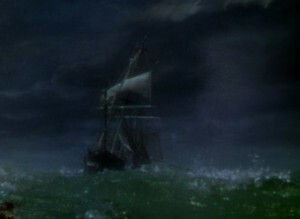 But I have to commend Edward Overstreet and Barney Wolff’s special effects; along with the visual effects team of Farciot Edouart, Gordon Jennings, William L. Pereira, and Louis Mesenkop did a stupendous job with the movie’s two special effects scenes – the hurricane at the beginning of the film, the giant squid that both Steve and Jack encountered underwater. The Hollywood community must have took notice of the film’s visual style. Milner and Skall earned Oscar nominations for their photography. Anderson, Dreier and Sawley all earned nominations for Best Art Direction. And the visual team of Edouart, Jennings, Pereira and Mesenkop won Oscars for the movie’s visual effects. The nominations and wins were all well deserved, as far as I am concerned. I must admit that despite the barrage of one-dimensional characters, “REAP THE WILD WIND” proved to be a first-rate story. It was nicely balanced with romance, drama and adventure. It featured a fascinating heroine who proved to be a complex character and not some one-note cliché. Even the love triangle proved to be interesting, especially since two parties of the triangle – Loxi and Jack – ended up underestimating Steve a great deal. I found that fascinating. And although I originally found the love story between Drusilla and Dan a bit sacchrine, it proved to have great consequences in the end. I read somewhere that the screenwriters – too numerous for me to list – made many alterations to Strabel’s novel. Since I have never read the novel, I see no point in comparing the two. I only hope that Strabel’s novel proved to be as exciting and well-paced as the 1942 movie. Despite my complaints about the one-dimensional characterizations in the film, I must admit that the cast managed to give some pretty good performances. Raymond Massey injected a great deal of energy and style into his portrayal of the villainous King Cutler. Despite being saddled with a remake of the Mammy character, Louise Beavers was equally entertaining as Maum Maria. There was one scene in which her character complained of Loxi taking her for granted that had me on the floor laughing, thanks to Beavers’ sharp performance. Both Susan Hayward and Martha O’Driscoll were solid as the two one-dimensional Southern belles, but it seemed obvious to me that they were better than the material given to them. And also Lynne Overman proved to be entertaining as Loxi’s loyal Yankee Captain Philpott. 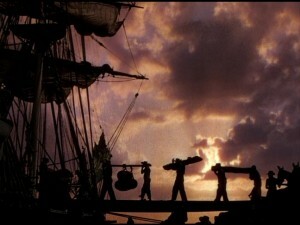 DeMille managed to capture another aspect of “GONE WITH THE WIND” by casting Oscar Polk (who portrayed Pork in the 1939 film) in the role of the free black sailor, Salt Meat. And Polk made the best of it in a well-acted scene in which he described the sinking of the Southern Cross during Jack’s trial. But four cast members had the opportunity to shine in roles that proved to be complex. Ray Milland did a great job in portraying the intelligent and somewhat sly Charleston lawyer, Steve Tolliver. I was impressed at how he skillfully balanced Steve’s strong-willed nature and gentlemanly nature – a balance that kept the other two major characters offguard. One of those characters is Captain Jack Stuart, who thanks to the script and John Wayne’s skillful performance, proved to be the most complex in the movie. Jack Stuart also proved to be Wayne’s first character with an obvious dark side and he made the best of it. Paulette Goddard, who was one of the four final actresses considered for the Scarlett O’Hara role, was cast as the movie’s main heroine, Loxi Clairborne. And she was excellent as the headstrong Loxi, whose heart seemed to be bigger than her sense. I was also impressed at how Goddard did an excellent job in conveying Loxi’s reluctance to admit the latter’s true feelings for Steve. More importantly, not only did she create a strong screen chemistry with Wayne; she and Milland proved to be a sizzling screen team. In fact, this was the second of their four screen pairings. Robert Preston, who has proven to be a favorite of mine, was excellent as King Cutler’s younger brother, Dan. Preston did a great job in conveying Dan’s torn feelings over his admiration for his more ruthless brother and his love for the ladylike Drusilla. I am not going to pretend that “REAP THE WILD WIND” was the epitome of Cecil B. DeMille’s career. It suffered from some unrealistic plot moments and plenty of one-dimensional characterizations. 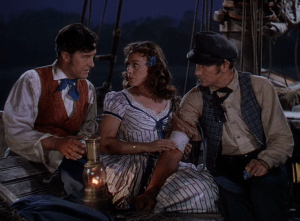 But the movie did benefit from a gorgeous visual style, an exciting and well-paced plot and some pretty damn good performances from a cast led by Ray Milland, Paulette Goddard and John Wayne. More importantly, all of this was crafted together with style, verve and excitement by Hollywood icon, Cecil B. DeMille.